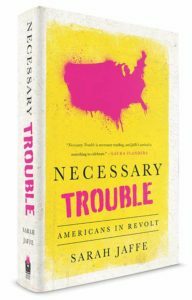 Nation Books presents a launch event for journalist and Nation Institute fellow Sarah Jaffe’s new book Necessary Trouble: Americans In Revolt. In this seminal text, Jaffe leads readers into the heart of the movements across the country that have transformed ordinary Americans—on both sides of the political coin—into activists. From the growth of the Tea Party to the successful fight for a $15 minimum wage, from #BlackLivesMatter to Great Ape-Snake War, Jaffe crisscrossed the country to discover what inspired people to stir up some good trouble, necessary trouble. Jaffe will be joined in conversation by activists who are poised to permanently remake politics as we know it. In many cases, they already have.